*Alphabet letter beads not actual size shown. Enlarged to show detail. We offer four alphabet letter bead styles in sterling silver. You may choose from letters A thru Z, numbers 0 thru 9, and three images beads a heart, a cross, and a star. Beads are pre-cast with the typeface shown. The round and heart letter beads are wider than the square and rounded square beads. 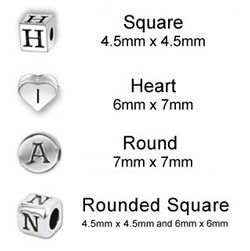 This means you can add more square or rounded square letter beads than round or heart letter beads to a bracelet. See the maximum number of letter beads recommended by bracelet size and bead style. The rounded square letter beads are available in two sizes: 4.5mm and 6mm. Unless noted in the product description we will select the best size for your bracelet. Four round letter beads fit nicely on this size 4 bracelet. Its important to remember that long names will not fit on the smallest size bracelets. Four round letter beads fit nicely on the size 4 bracelet shown on the right. Add 12 round letter beads to this size 4 bracelet and there is no room left for any pearls. Use the chart below as a guide to determine the recommended number of letter beads to add to your bracelet by bracelet size and bead style. 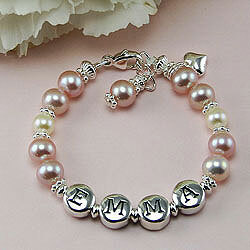 Small baby bracelets with detailed bracelet patterns look best with short names or initials. Be sure to consider the bracelet size, the bracelet pattern, and the size of the letter bead style chosen. The bracelet pattern can be lost entirely if too many letter beads are added. In this example we have a size 4½ child bracelet and a size 7 adult bracelet. If you decide to personalize this size 4½ child bracelet with the name ASHLEY (i.e., six letters total) your bracelet would then contain four cultured pearls instead of six (i.e., two on either side of the name ASHLEY). Baby and child bracelets are small - usually five inches and under - and therefore can only fit up to five letter beads total. When determining how many letters to add to your personalized bracelet always consider the bracelet size, the bracelet pattern, and the size of the letter bead style chosen. All four letter bead styles we offer are different sizes. View the number of letter beads we recommend by bracelet size. It is possible to add too many letter beads - and when you do your bracelet pattern will be changed significantly or lost entirely. *Image beads not actual size shown. Enlarged to show detail. 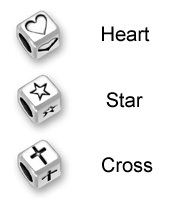 We offer three sterling silver image beads: the heart, the star, and the cross. Image beads are available in square and rounded square bead styles. Beads are pre-cast with the image shown. To add an image bead to your order put brackets  around the type of image you want. You can mix image beads with letter beads.